256 pages | 20 B/W Illus. Despite campaigns to educate and increase awareness, discrimination continues to be a deep-rooted problem in sport. 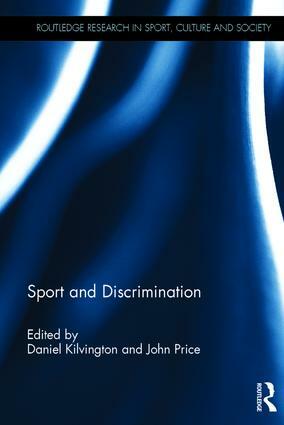 This book provides an international, interdisciplinary and critical discussion of various forms of discrimination in sport today, with contributions from world-leading academics and high-profile campaigners. Divided into five sections, the book explores racism, sexism, homophobia, disability, and the role of media in both perpetuating and tackling discrimination across a variety of sports and sporting events around the world. Drawing on examples from football, rugby, cricket, tennis, climbing, the Olympics and the Paralympics, it offers a critical review of current debates and discusses the latest empirical research on the changing nature of discrimination in sport. Taking into account the experiences of athletes and coaches across all performance levels, it presents recommendations for further action and directions for future research. A timely and challenging study, Sport and Discrimination is essential reading for all students and scholars of sports studies with an interest in the sociology of sport and the relationship between sport, society and the media. Daniel Kilvington is a Senior Lecturer in Media and Cultural Studies at Leeds Beckett University, UK. His research interests include ‘race’, racisms and ethnicity within sport/media contexts. Kilvington is the co-author of Race, Racism and Sports Journalism (2012), Sport, Racism and Social Media (2014) and author of British Asians, Exclusion and the Football Industry (2016). He is the co-founder of the Sport and Discrimination Conference series, and a trustee of the community cohesion charity, The Zesh Rehman Foundation (ZRF). John Price is a Senior Lecturer and Programme Leader for BA (Hons) Sports Journalism at the University of Sunderland, UK. He is co-author of Race, Racism and Sports Journalism (Routledge 2012) and Sport, Racism and Social Media (Routledge 2014). His most recent research has examined issues of gender diversity in the sports media and sports journalism education. He is a former journalist.